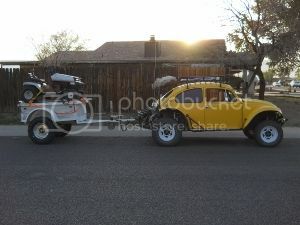 AzBaja.com, Home of the VW Baja Bug -:- Baja Forums -:- Off-Road & VW Based Clubs (4x4, ATV, Jeep, Motorcycle) -:- Events and Get Togethers World Wide -:- AzBaja Playday 2017? Baja Forums -:- Off-Road & VW Based Clubs (4x4, ATV, Jeep, Motorcycle) -:- Events and Get Togethers World Wide -:- AzBaja Playday 2017? Post subject: AzBaja Playday 2017? Tentative Date is earlier this year, 6,7,8th of October. What is everyone's opinion on moving the location of the playday to the east side. Maybe the area where they had the last Presidents Day camp out (N33 11'27.9" W111 18'07.5") Cottonwood Canyon, or stay at the Hassayampa? I'm okay with an October date. It's going to be a bit warmer than a November weekend though. Now that I have no job, I'm open to most any time. Post subject: Re: AzBaja Playday 2017? Did not see the GPS tag. My bad. talk about odd it is the same time from my place to either site. go figure. I'm ok with that if every one else who has been out to the new spot likes it why not. Something new. I vote Hassayampa because I live like 5 minutes from there. No. intel in April of 2016 laid of over 800 people in Arizona mostly for being older and not fitting into a diversity bracket. Being old, white, male, and straight, the odds were better you were in the group of 800 intel let go. How many years with intel? 21 years @ intel and 2 years from making it to retirement status. Just look for my rail and trailer....got a 25' tall flag pole....will be flying old glory. sent PM about your radio. am interested.